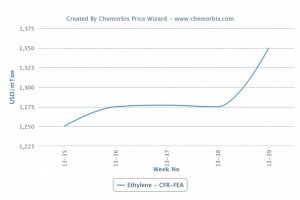 Spot ethylene prices moved upward in Asia this week despite weaker upstream markets as per the pricing service of ChemOrbis. Crude oil futures on the NYMEX declined 3.3% last week, posting the biggest five-day drop since June. Brent crude futures were also down by 3.2%. Tracking the downward momentum of crude, spot naphtha prices on a CFR Japan basis dropped by over $20/ton on the week. Spot prices on a CFR Northeast Asia basis climbed $80/ton to move above the $1300/ton threshold. Spot prices on a CFR Southeast Asia basis also increased by over $60/ton. 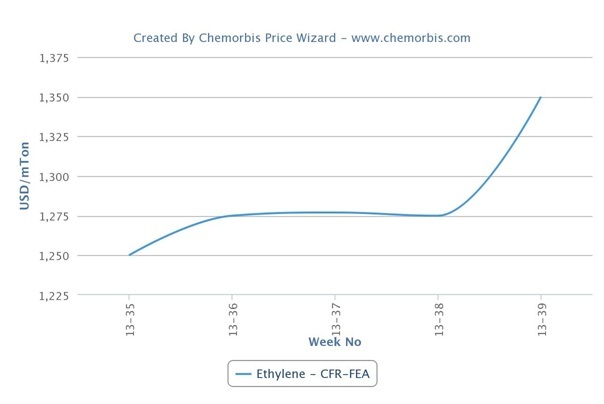 Tight supply was cited as the main reason behind higher ethylene costs. Mitsubishi Chemical shut its 476,000 tons/year No 2 steam cracker in Kashima, Japan for a 50-day maintenance at the end of August. The cracker is expected to remain offline until the middle of October. Mitsui Chemicals shut its 450,000 tons/year Osaka cracker in Japan on September 19 for a turnaround expected to last until October 2. Formosa Petrochemical’s No 2 steam cracker in Mailiao, which has an ethylene capacity of 1.03 million tons/year, was shut for a 45-day maintenance on September 15. Thailand’s PTT Global Chemical’s 515,000 tons/year I-4 No 1 cracker in Map Ta Phut was still offline as of September 17 after being shut for a planned maintenance on August 1. Market sources commented that the cracker was expected to resume operations over the weekend. Taiwan’s CPC’s new No 6 naphtha-fed steam cracker, which has an ethylene capacity of 600,000 tons/year, was in a shutdown process as of September 12 for safety checks. Market sources commented that the second phase of test runs was slated for October 4. According to ChemOrbis, several upcoming cracker shutdowns are expected to add to the tight supply situation in the region in the next few weeks. Korea Petrochemical Industry (KPIC) is planning to shut its Onsan naphtha cracker on October 5 for a planned maintenance which is expected to last 25 days. ExxonMobil is also expected to shut a cracker with an ethylene capacity of 900,000 tons/year on Jurong Island in Singapore for a planned maintenance in October. Thailand’s Map Ta Phut Olefins is also expected to shut its 900,000 tons/year naphtha cracker for a turnaround in the middle of November.